In my time at various dojos as a member, or as a visitor, it has come up numerous times as to what a black belt is, what does it represent and what it does not. In many cases it is viewed as a landmark of excellence and others as a starting point in ones understanding of the art and one’s individual progress on a path. In dojos I have practiced in the range of “technical expertise” has varied dramatically which used to puzzle me. In North America “the belt” has over time morphed into somewhat of a status symbol and goal for many practitioners but real value depends much on the individual and the rigour and or philosophy of the dojo/association. I remember being in a car with a number of dojo members and our Shihan just after I had begun my study and the question arose as to when one became competent. If my memory serves me correctly, and it is beginning to become suspect, his response as 4th Dan. There was a moment of silence as we all probably calculated in our heads how long that would take us to get there and a sense of disappointment set in as fourteen years (by our requirements ) seemed so far away. I admit that when I started, at 49 years of age, my goal definitely was a black belt, and to get there before I was 55, which I missed by one year. This was based upon what I had read about the late Sensei George Leonard of Tamalpais as he too was a late starter in our art. When I did reach that level I was satisfied with my progress as well as proud. 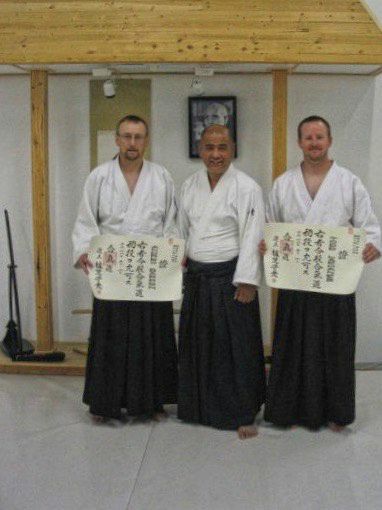 To this day I greatly treasure the photo of myself and my training partner standing for a shot with our Sensei holding up our Hombu Dojo certificates. When I look at that pixely image now, and see the smile on his face, it makes me feel that I had honoured him as much as us, to achieve that level. Since his premature passing number of years ago I acknowledge his painting that we hang up before each practice in the dojo and give a silent thank you as we bow in. After teaching a class, I again look and the picture as I bow out, as know that if he was here he would laugh and ask me what the hell I was teaching and show me how to do it properly. Since Shodan my mindset has altered dramatically and I realize that what my belt recognizes is my dedication and contribution to the dojo perhaps more than technical level. After all, Shodan, when translated, means “beginning degree,” and is the lowest black belt rank in Japanese martial arts. It is traditionally called Shodan as it is only a start and not Ichidan (First Degree). In the years following that test I have been reluctant to be examined and had to be “pressured into it my dojo friends and our Shihan, but it has not had the same feeling for me. What I love, and get out of training, is the practice and being part of the community that Aikido gives me, and how I can contribute to others who enjoy the same thing. Some days on the mat, as a student as well as a teacher, I feel that I deserve my rank and on others wish I still was wearing my white belt as I feel like a novice. My belt is still merely holding my dogi together.